Introducing the prefab multipurpose space that could be the future of urban housing. What if we told you that for just over $190,000, you could get a house prepared, delivered, installed, and hooked up to utilities? Oh, and that it’ll also be move-in ready in under a day and super eco-friendly. Sounds like a futuristic dream, right? Well, the future is here, and it’s called KODA. 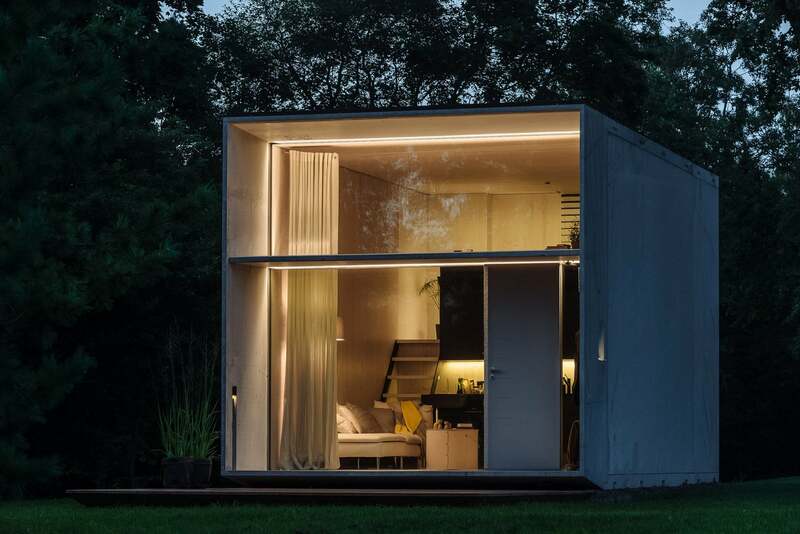 Initially unveiled as a prototype last year by Estonian design collective Kodasema to general acclaim (including making the shortlist for the World Architecture Festival’s Small Project Award), KODA is a prefab multipurpose tiny home. Now, marketed as a “future-proof movable concrete house,” the 260-square-foot living solution finally made its debut at the BRE Innovation Park in Watford, U.K. – a stacking model of the design will be released in 2018. The KODA is the ultimate small space. Not only is it super easy to assemble —you can have it fully built in under seven hours, thanks to its lack of a foundation— it’s also designed to be transportable, thereby making it an ideal living solution for those with an on-the-go lifestyle. According to Kodasema’s John O’Brien, the relatively affordable prefab home was created as a solution to the UK’s housing crisis. Since all you need is a truck and a crane for assembly, the idea is that owners can make use of unused plots of land by repurposing and relocating their KODAs. And thanks to its flexible design, the space can be adapted to suit a number of purposes. Use it as an office, workshop, classroom, or even café. Though of course, its primary forecasted function is as a living space: the “KODA for Living” model for the home includes an open-floor lounge and kitchen area, a bathroom, and a mezzanine bedroom. “KODA would provide a cost-effective option to house those on the waiting list for affordable accommodation or offer temporary rental apartments for your professionals, students, and those looking to downsize,” said O’Brien. In addition to ease of assembly, the innovative and environmentally-friendly design of KODA is a big selling point. The tiny home is designed to be sustainable, featuring solar panels on the roof and natural, non-toxic finishing materials. It’s also outfitted with the latest smart-home technology (like adjustable LED lighting and climate control) and weather-proof concrete to ensure minimal maintenance. Want to test out the prefab home all for yourself? While you wait for the KODA to become available for purchase, you can visit demo houses in the UK, Holland, and Estonia. Would You Live In A Tiny Dome?